The model is in near perfect condition, due to minor paint imperfections. The model is unboxed. A 1955 GMC PD 3751 in the livery of Trailways. A superb model of the of this Bus. With amazing detail including wing mirrors, wipers and exterior lights. Captain Scarlet. Fantastic detail. This item would make an excellent addition to your collection and a fantastic display piece. 1/43rd Scale. 1/24th Scale. 1/18th Scale. 1/32nd Scale. 1/76 'OO' Scale. A superb model of the of this Bus. With amazing detail including wing mirrors, wipers and exterior lights. a black plastic plinth, with a perspex lid with a card sleeve and plastic wrap. The model is 24.5cm long. T he box is in good condition, due to wear. This model is based on the TD 3610, built from 1946-48. 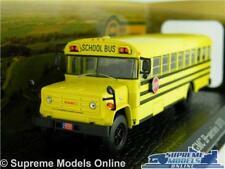 GMC 6000 SCHOOL BUS school bus US IXO for Hachette 1:43 new in orig. Serie Bus Collection. Fahrzeugtyp Bus. Produktart Bus. Fahrzeugmarke GMC. Due to small parts not suitable for children and people under 15 years. Ixo GMC Bus Scenicruiser Greyhound 1956 White/Blue. Type: Scenicruiser Greyhound. Manufacturer: Ixo. Model Car 1:43 Genuine New. scale 1:43. We will compare serial no. GMC 6000 LAP DETAIN TRANSPORT LOS ANGELES 1988. Numéro de pièce fabricant ixo bus 017. Année du véhicule 1988. Fahrzeugmarke GMC. Modèle de véhicule 6000. EAN 4895102322985.